A little known fact of making comics is that the creator prevaricates. Just then I went out to see if my wheelie bin has been returned, to avoid writing this. Many creative works are generated from a spur-of-the-moment thought or set of actions. Focussing on one idea, is where it’s at. I’ll admit to time excess on a project, but my best works are undoubtedly the ones I just did quickly. I’m good at this. Here’s what I think we should do. I’ll tell you how to make comics in fifteen minutes. And for another fifteen, I’ll talk about creator’s rights and self-publishing. Then you spend an hour on making a page of your own. If you want to pair up, you can run your work to two pages. We’ll work in biro as it’s speedy and less messy. Paddy Brown, or PJ Holden will be around to offer support. No ‘To Be Continued’, no pin-ups; sequenced visual/textual story – is the way. When the clock stops, it’s over. You’ll sign a form saying I’ve a one-time right to reprint your work and as you saunter around the convention. I’ll be doing just that. Within two hours, a limited edition anthology comic featuring your creativeness, for free. How’s that for hey presto? 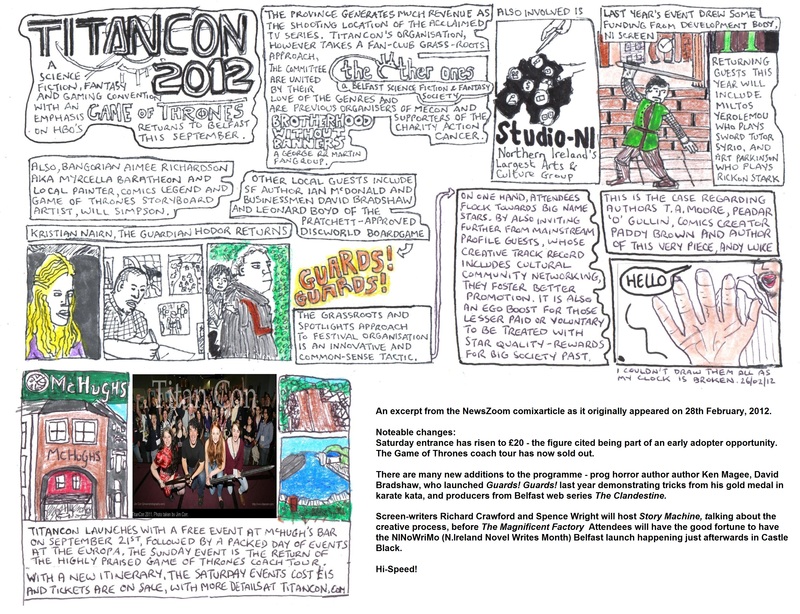 The Magnificent Factory makes it’s debut this year at TitanCon, Europa Hotel, Belfast, 22nd September. You can read more about it on their website, and join the Facebook group for TitanCon and one for The Factory. You can help me anticipate the publication by pre-registering as an author at this facebook link or that email. Please don’t if you won’t. We’ll be making an 11am start at Castle Black. Numbers are inevitably limted, though there will be an in-session registration. If you’re further afield, The Magnificent Comic Book Factory will be visiting Galway in February 2013.
ps The workshop hosted by myself and Downey as part of Bounce! was an incredible busting success. Watch this space, stephendowneygallery.com and the ADF.ie for more news.